"Visionary Painting workshops with Kuba Ambrose & Vera Atlantia: October 2017"
We feel extremely honoured that visionary artists Kuba Ambrose and Vera Atlantia will be teaching in the Anam Cara centre for the 3rd year. Kuba & Vera are both teachers at the Vienna Academy of Visionary Art and will guide you to paint your inner vision, working in the technique of the old masters. Video: About the workshop & Misch-techniek, with pictures and videos. >>> Click here to see the photo album of the 2015 weekendworkshop. Learn to paint in the technique of the old masters. 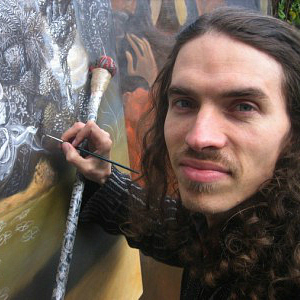 Vera Atlantia and Kuba Ambrose teach painting at the Vienna Academy of Visionary Art and have been leading painting workshops in Austria, Belgium, Australia & the UK. We are very happy that they are coming back to teach two weekend workshops at the Anam Cara Centre in October 2017. These workshops will focus on both oil and egg tempera painting as well as the Alla Prima painting technique. Some of these techniques were taught by the Austrian painter Ernst Fuchs with whom Kuba & Vera apprenticed for some time. Besides transmitting the technical aspects of painting, Kuba & Vera also seek to integrate the sacred and devotional practices into their workshops. 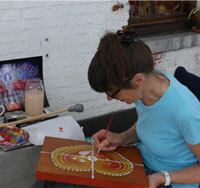 Through short guided meditations, mantra and prayer you are encouraged to explore the sacred aspects of your painting. Training for beginners & advanced students. This program is both suited for beginning and advanced painters who want to learn to work with the Alla Prima-technique or want to deepen their spiritual and technical approach of making art. Even people with no painting experience can start working with this wonderful technique and bring life to their connection with the divine. Art can give vision to our highest longing and aspirations. In this workshop we will discover the power of creating art with intention while exploring the many facets of oil painting. Beginning with a guided meditation, we will connect to our visions of healing for ourselves and the world. We will work with oil paint on prepared panels to express our painted prayers. - Workshop days are from 10 - 18 hrs and start with a guided meditation. Total of € 520 for 5 days of training, all materials meals, snacks & drinks. During this workshop you will be invited to create a small scale artwork working with oils on a wooden ikon panel. Participants will be guided step by step through the process, from conception to composition, drawing stage through to the final work. Stylistically we will focus on the approach taken by artists of the northern Renaissance school with some modern day additions to the process. Participants are encouraged to use art as a tool for expressing what is deeply sacred to their heart. It is our intention to create a sacred space which allows all to flourish in their creative expression. Chanted prayer and silent contemplation will serve to connect us in peace and unity..
For students of Vera & Kuba, there is the possibility to paint in the studio and continue their work during these "Open Studio-days". Kuba will give informal teaching and personal guidance where needed. The art of Vera Atlantia (Austria) reflects our intimate connection to Source and the deepening experience of spiritual awakening. Inspired equally by words and images, this Austrian-born artist has explored both art and writing as a life-long pursuit into self-inquiry, healing and the inner world of the soul. In particular, the vision journey, meditation and writing have led her into deeper dimensions of consciousness and the imagination. Bring with you: Sketchbook for notes and drawings, pencils and brushes. Times: All workshops days are from 10 - 18 hrs and start with a guided meditation to deepen your artistic work. Discount of 75 euro: 520 € including materials, 5 meals and drinks & snacks. 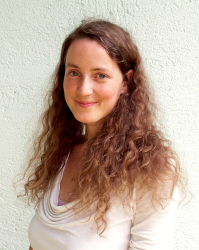 “My 10 day retreat with Kuba and Vera was nothing short of incredible. Individually and united, their gentle guidance in meditation and sharing of tremendous artistic skills, nurtured and developed by the late and great Prof. Ernst Fuchs, had me feeling honoured and overjoyed to have the time, space and opportunity to reveal and be informed by my own highest potential, as the beauty, balance and clarity unfolded upon the canvas, layer by layer. “Kuba Ambrose and Vera Atlantia artfully created a space for sacred works of art to emerge through each one of us, during Art In Paradise Retreat in beautiful Byron Bay Australia, October 2015. Their teaching and the wholesome environment nurtured us all to create works of art that were of group-heart-consciousness. Both Kuba and Vera presented as deeply compassionate, insightful and sensitive beings- wise for their age. They were adept at holding space for a group to evolve. Nicely drawing on a combination of humour and firm discipline, they guided us to complete our conceptual visions. I experienced the joy of co-creation when the introduction group meditation by Vera inspired my conceptual vision to emerge. The closing meditation by Kuba inspired a poem relating to the same vision. The group dynamic revealed magical moments as we shared meditation circles and sang for world healing and peace. “Painting with Vera & Kuba has brought a profound change in my painting, and my confidence. Through the meditations and working with the Misch-technique, I found new ways of surrendering to the painting-process, where I used to be more controlling. Even though my style has always been very detail-focused, working with them opened me up to new ways of letting the process guide me. What came from this was a work that is very dear to my heart, and a new pathway of possibilities. As someone who has been painting for a longer time, I was also very impressed by how they could guide absolute beginners to bring forward beautiful works of art. They are both magnificent teachers, with not only the skills to teach painting, but the experience and personal depth to bring out beauty and spiritual connection in their students. I highly recommend working with them if you get the oppurtunity!